18 year old IM Jon Ludvig Hammer from Oslo won the Gjøvik 100th anniversary tournament alone with 7 points from 9, ahead of 10 strong GMs how whom 6 were rated above 2600. In last round he defeated also Polish GM Bartel with black, and Hammer now becomes Norway's tenth Grandmaster. 13 year old Nijat Asad Abasov from Azerbajdzhan achieved his fifth(!) IM norm defeating GM Malakhatko in the final round. WIM Nargiz Umudova (19) of Azerbajdzhan got her second WGM norm. 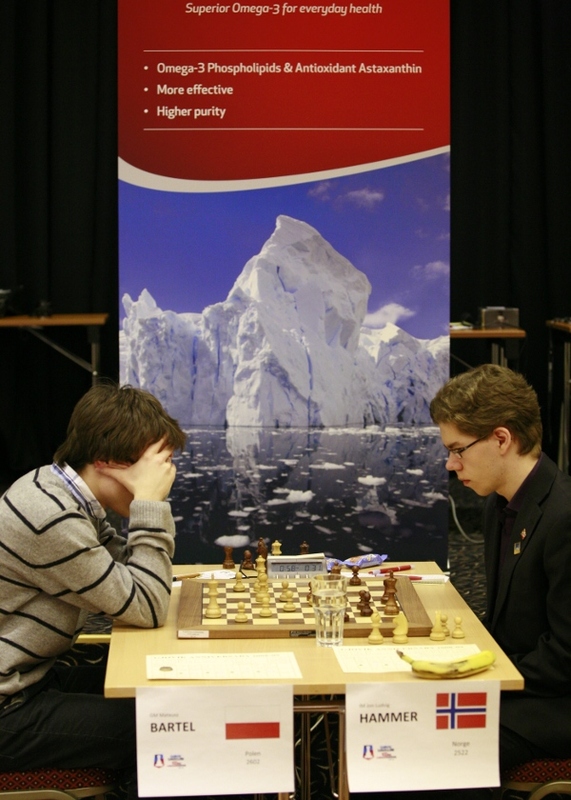 Jon Ludvig Hammer during last round at Gjøvik, winning against GM Bartel (2602) of Poland. 18 year old Jon Ludvig Hammer from Oslo took the unshared top place in the chess festival in Gjøvik, after he defeated the strong Polish grandmaster Mateusz Bartel. Hammer delivered one of Norways biggest chess achievements through the ages by winning the Gjøvik Chessclub's 100th-year anniversary tournament ahead of ten grandmasters and will now himself be Norway's tenth grandmaster in chess. 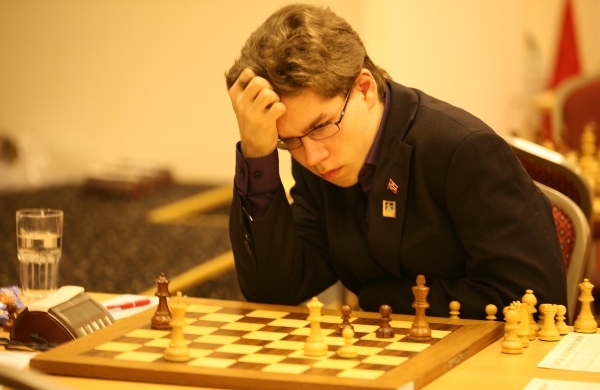 The young chessmaster Jon Ludvig Hammer in action, on his way to victory in the last round in Gjøvik. Of the 70 players Jon Ludvig Hammer ended up alone on 7 points after nine rounds, followed by grandmasters Geetha Gopal from India, reigning European Champion Sergey Tiviakov from the Nederlands and Boris Savchenko from Russia. Hammer would have made the grandmaster title with a draw in the last round against Bartel, but showed his confidence by playing on for a win and the tournament victory. International master Eirik Gullaksen from Bergen became the second best Norwegian placing 15th in the exclusive field, while Frode Elsness from Moss and Richard Bjerke from Oslo was number 19 and 20. Khayala Isgandarova from Azerbajdzhan was at 11th the best placed woman. The B-group in the tournament was won by Tor Wetle Hoem from Molde ahead of Anders Thingstad, Hønefoss and Henrik Sjøl, Akademisk. Gjøvik Chessclub's 100th-year anniversary festival was in fact the most significant chess event in the world at the start of 2009 and has been followed move by move over the Internet from around the world. During ten days the tournaments saw about 350 active players spending in all over two thousand participant-days. Jon Ludvig Hammer (18) from Oslo Schakselskap defeated Tuesday the strong Russian grandmaster Oleg Korneev in the penultimate round of Gjøvik Chessclub's GM Swiss anniversary tournament. The victory came at the right moment, because Hammer now has the chance to become a grandmaster of his own if he manages at least a draw in the last round against the Polish grandmaster Mateusz Bartel. This is far from an easy task especially since the young Norwegian has to play with the black pieces. After eight rounds in the tournament Jon Ludvig Hammer is in a shared lead with the five grandmasters Geetha Gopal, India, Sergey Tiviakov, Nederland, Boris Savchenko, Russland og Aloyzas Kveinys, Litauen. In the B-group Tor Wetle Hoem from Molde leads ahead of 13 years old Anders Thingstad from Hønefoss. Last round is played Wednesday morning. 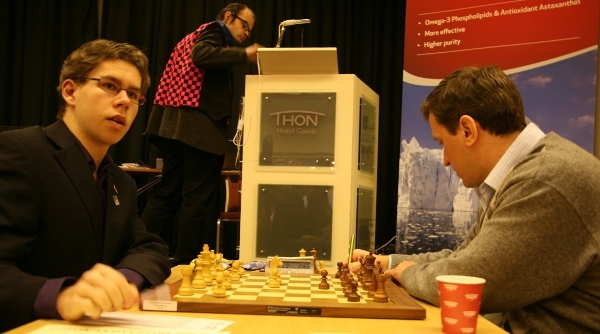 Successful Jon Ludvig Hammer (at the left) on his way to victory over grandmaster Oleg Korneev in the chess festival in Gjøvik. Russian champion Peter Svidler (32) won the last rapid game against home favourite Magnus Carlsen (18) to win the Aker Chess Challenge in Gjøvik, Norway. After drawing his black game of the final easily, Carlsen was better in his white game, but he suddenly overlooked a mortal counter-chance. Both players had only quite few seconds left on the clock, and Carlsen had only very few when he made the grand mistake. 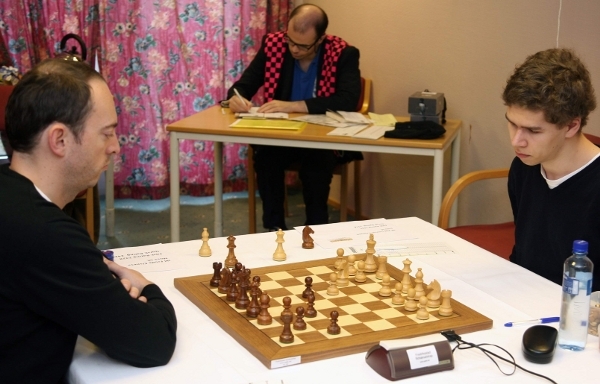 Hikaru Nakamura (21) won the bronze final against Kjetil A. Lie (28). After winning his white game clearly, Nakamura had problems with black, but got the opportunity to sacrifice a rook nicely and force a draw. After 7 rounds of the Gjøvik chess club 100th anniversary swiss tournament GMs Malakhato (Belgium 2633), Gopal (India 2548) and Kveynis (Lithauania 2533) share the lead with 5 1/2 points ahead of top seeds Tiviakov, Savchenko and the rest of the strong 70 players field. During last weekend Boris Savchenko (Russia 2648) won the Open Norwegian rapid chess championship (170 players) ahead of Mchedlishvili (Georgia 2615), Malakhato and Norwegian IM Eirik Gullaksen (2400) who all achieved 6 1/2 points from 8 rounds. Prize giving at the Aker Chess Challenge in Gjøvik, Norway. 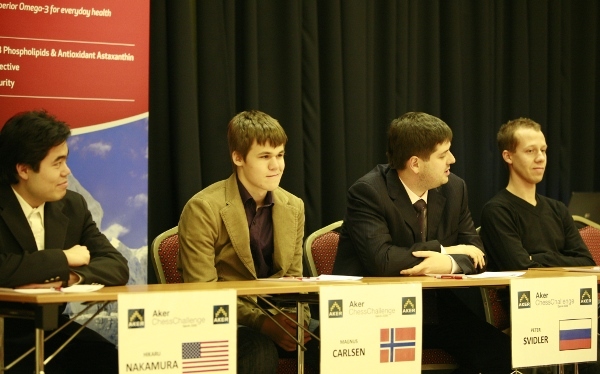 Peter Svidler of Russia (left) beat Magnus Carlsen in the final, while Hikaru Nakamura of USA beat Kjetil A. Lie, both with 1 1/2 - 1/2. Between them Jannik Lindbæk, senior vice president of the sponsor company Aker Solutions. Magnus Carlsen qualified Sunday for the final in the super rapid chess Aker Chess Challenge in Gjøvik after blitz chess play-off games. In the final Monday Norway's chess star meets the reigning and five times Russian Champion Peter Svidler in two games. After the six preliminary rounds, Carlsen shared first place with Peter Svidler, Russia and Hikaru Nakamura, USA, so the three had to play a deciding single-round blitz chess match with four minutes per game plus two seconds added per move for each player. Svidler started the play-off with a victory against Nakamura, then Carlsen won over Svidler. 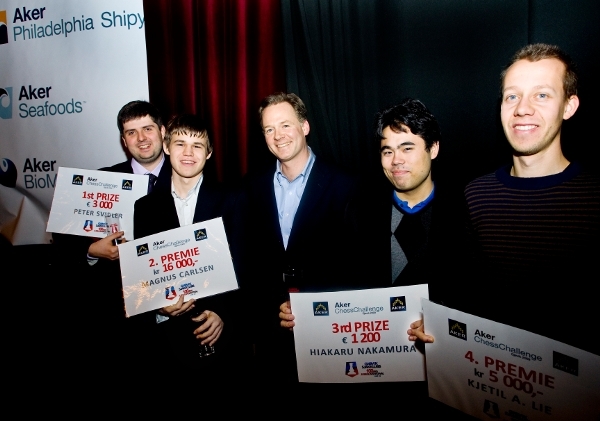 The last game Nakamura - Carlsen was dramatic for the players and top entertainment for the audience in Gjøvik cinema. The Norwegian got a good position as black after a sharp opening, but the game became incredibly complicated when both players had less than half a minute left on the clock. The American got dangerous counter-chances, but failed to exploit them correctly, after which Magnus Carlsen quickly won. The American chess star Hikaru Nakamura will therefore play in the bronze final on Monday against Kjetil A. Lie from Porsgrunn, Norway. The great chess festival in Gjøvik continues into Wednesday evening. Magnus Carlsen excelled on Sunday and won twice against the five-times Russian Champion Peter Svidler in the Aker Chess Challenge in Gjøvik. After the drawing of lots Svidler faces Nakamura and Carlsen his own compatriot Kjetil Lie in the opening round of the exclusive rapid tournament Aker Chess Challenge in Gjøvik, Norway. After 4 rounds of the Gjøvik 100th Anniversary tournament, the GM quartet Malakhato (BEL), Kulaots (EST), Gopal (IND) and de Firman (USA) leads the with 3 1/2 points each. Top seeds Tiviakov (NED), Savchenko (RUS), Mchedlishvili (GEO) and Bartel (POL) are among the ten players at 3 points. This tournament is probably the strongest Swiss event ever in Norway. The international chess festival of Gjøvik consists of a number of different tournaments for players of all levels and ages. The International Masters Frode Elsness from Moss (left) and Jon Ludvig Hammer from Oslo is Norway's top players in the GM Swiss in Gjøvik. The picture is from the playoff match for the Norwegian Championship this autumn, where Elsness won and secured the Royal Cup. In the background tournament arbiter Hans Olav Lahlum who will be the chief arbiter also during the chess festival in Gjøvik. Lahlum represents Porsgrunn Chess-club in the top chess league, but lives in Gjøvik. Norway's foremost chess arbiter has in the recent years actually become even more famous as a writer and historian. Hammer is a class mate of Magnus Carlsen, who will face Peter Svidler (Russia), Hikaru Nakamura (USA) and Kjetil Lie (Norway) in the rapid tournament "Aker Chess Challenge" from January 2nd. 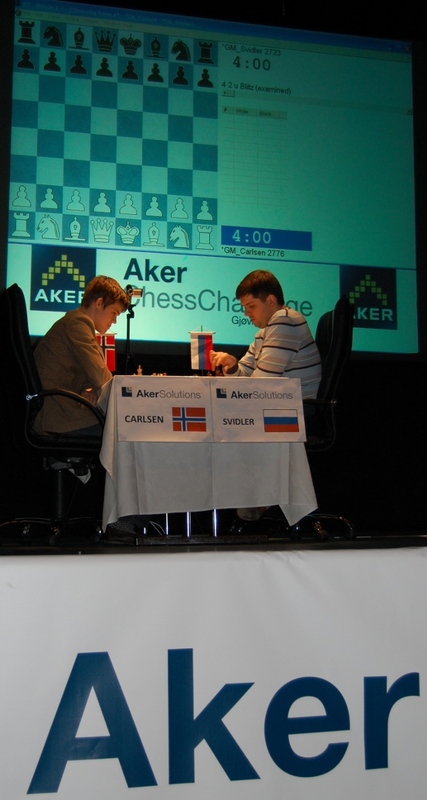 The big international Norwegian company Aker has become the main sponsor of the Gjøvik chess festival. The numerous Aker companies are active within the oil and gas industry, in marine technology and fishing. The "Aker Chess Challenge" will draw the attention as a main event of the chess world during the first five days of 2009. Gjøvik Chessclub 100th-Year Celebration Festival has found its main sponsor in the industrial giant Aker. The festival high point, a speed chess match between the star players Magnus Carlsen, Peter Svidler (Russia), Hikaru Nakamura (USA) and Kjetil Lie in Gjøvik cinema from the 2nd to the 5th of January, will be named ”Aker Chess Challenge”. This will be the first time in almost a year and a half that Norways young chess hero Magnus Carlsen participates in a Norwegian tournament, a big event in itself. 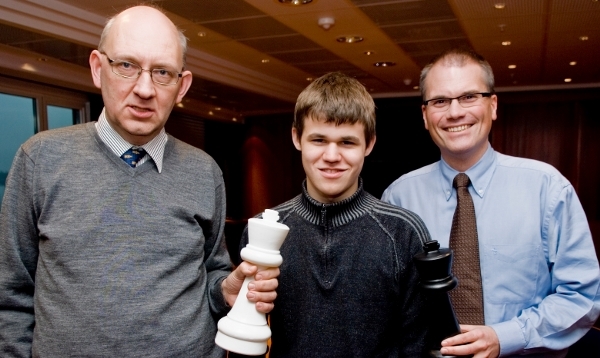 Magnus Carlsen, just recently 18, is ready for battle in Gjøvik from January 2nd. Here surrounded by Øystein Brekke (left), chairman of the organizing committee, and Geir Arne Drangeid, executive vice president in Aker ASA. "It's brilliant that an important Norwegian company like Aker recognizes the opportunity when the chess elite meets, and their involvement has been essential for us to execute our plans to the full", comments Øystein Brekke, chairman of the Gjøvik festival organizing committee. The four grandmasters that will fight for victory in Aker Chess Challenge all comes from countries where Aker have significant activities, and the same is true for many of the other participants in the chess festival in Gjøvik. "Russia, USA and Norway are important countries for Aker. We are pleased to be able to help make such a meeting of masters take place", says Geir Arne Drangeid, executive vice president and senior partner in Aker ASA. The numerous Aker companies are active within the oil and gas industry, in marine technology and fishing. "Chess is a professional sport for some and a pleasant leisure activity for very many. Besides that, it's very rewarding. Studies have shown that children and young playing chess improve their creativity and ability to concentrate, furthering their educational progress especially within mathematics and natural sciences. For a technology company like Aker this makes for an interesting connection between chess and our company activities", says Drangeid. The chess festival in Gjøvik is one of the most important chess events in Norway ever. It starts December 29th and continues until January 7th with tournaments for chess enthusiasts at all levels. Among the ten grandmasters playing in the semi-open anniversary tournament the three highest rated are the current European champion Sergei Tiviakov (Netherlands), Boris Savchenko (Russia) and Vadim Malakhato (Belgium). Another highlight is the open Norwegian championship in rapid chess during the weekend the 3rd and 4th of January, which can be combined with watching Magnus Carlsen & co playing in Aker Chess Challenge.